The mosaics in the Roman villa at Piazza Armerina (said to once be the hunting lodge of THE emperor) are undergoing an Xtreme makeover! A grant from either UNESCO or perhaps Italy is paying for the cleaning, restoring, and preservation of this fabulously rich archaeological site. See an earlier post by me HERE. And see my old photos on FLICKR. I was there today with more than thirty of our AVID high school students, another teacher, and three tutors, and we were all amazed by the amount of activity and work going on inside the villa, which is covered in plexiglass. We could still move around and see most of the floors, but we also saw lots of workers, hoses, bags of grout, tiles, glue, air hoses, electrical cords, plastic, etc. It was archaeology at work! It was also pretty cool to have the place almost completely to ourselves AND to get in free as a school group. To top it off, the bar gave us adult chaperones free cappuccini! Oh, by the way, the kids enjoyed themselves and learned a lot with an inquiry exploration activity. It looks like this work is going to continue for quite some time, considering the villa floor cover 3500 square meters (42 colorful floors in 63 rooms) and are made up of an estimated 30 millions little tiles which are over 1700 years old! Of course, AAA (or ADAC in Germany) does not exist in Sicily. Luckily, though, I have something better than both of them--Tony, my personal mechanic! On Friday, my friend Awilda from Heidelberg and I started out to meet friends in downtown Catania for lunch. It's only about fifteen miles, all downhill, but right smack dab in the middle of the city, my Mini suddenly started making a horrible sound and stopped running as smoke/steam poured out from under the hood. This happened, of course, on one of the busiest streets in Catania, Viale Africa, with bumper-to-bumper four-lane traffic! We pushed the car to the side (kind of double-parked), put on the flashers, set out the triangle, called Tony, and then did the Sicilian thing--went into a bar for cappucini! Really, what was the point of just standing around on the sidewalk breathing car fumes? When we came back, we found several cars had followed our lead and double-parked right behind us! Two lanes of traffic continued to squeeze by. Within fifteen minutes, Tony came and rescued us. He said he would drive my car and I would drive his and follow him. Before we even got out of Catania, it overheated again (the fan was not working), so we both pulled over and had another round of cappucini. Tony insisted on paying for it, despite my protests. Once on the highway, the wind cooled the engine and we got it to his shop across from NAS I (Sigonella). He thought he would have to keep it over the weekend and called someone who offered 15 euro/day rental cars for me. I offered to give Awilda a tour of the base facilities and have lunch while we were waiting for the rental to be ready. As we were having lunch, though, we got a call from Tony. It turns out that it was just the fuse that is supposed to run the fan. He replaced it and all seemed to be well. Good grief! Tony wouldn't take any money, so I bought him some nice steaks and promised to bring the car back for a closer look on Monday. I was thinking, though, without AAA or ADAC, what would I do without Tony? Tony is a Sicilian-American who was born here, grew up there (New Jersey), married here, had his kids and raised them there, and then moved back here to settle down and start several business ventures. He used to have his shop near the now-closed Comiso Air Base in southern Sicily but moved up here when that closed. He drives more than an hour each way to his shop here, which he operates with his son Anthony. 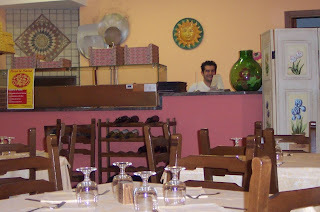 Tony and his wife help their son John run his restaurant in Scoglitti, right on the seaside on the southern coast (see John in restaurant above). Both sons, his daughter, and three grandkids all live nearby. At his invitation, Susan and I ate a delicious seafood dinner at the restaurant and had a tour of the whole area last spring. Tony's next project includes a reception hall, mini-golf, and camping area. In spite of all that, he still has time for some American friends, of which I am happy to call myself one!